When the vast armies of the Mongol Empire entered Europe in the mid-thirteenth-century, they would unleash a wave of change – smashing some kingdoms while benefitting others. How did the Mongol presence in the Balkans effect its two main political powers – the Byzantines and the Bulgarians? In the early decades of the thirteenth century and while the Russian princes of Volyn, Chernigov and Smolensk were fighting for the throne of Kiev, major political developments took place at the other end of the Eurasian continent, which would have huge geopolitical consequences for the Eurasian continent. A young Mongol tribal leader, named Temutzin, subjugated the Mongolian and Turkish tribes of Mongolia. In 1206, a quriltai, or assembly of military and prince officials from these tribes, chose Temutzin as Great Khan, thus marking the beginning of the great Mongol Empire. Until 1227 when Chinggis Khan died, as Temutzin became known, the conquest of northern China was in progress, which began in 1211 and continued until 1234. Meanwhile, the Mongolian Khan extended his empire to the west to incorporate the Khwarazm region in Central Asia. It should be noted that reconnaissance units had also explored the Caucasus mountains, and some had turned towards the steppe to the north of the Caspian Sea. When Chinggis Khan died, the lands of the Mongol Empire were distributed among his heirs, the four sons he acquired with his first wife. According to the Mongolian custom, the territories (ulus) that Chinggis Khan had conquered in the heart of the Empire were given to the youngest of his sons, Tolui. Ogedei, the third of his sons, was proclaimed Grand Khan, while his second son, Chagatai, received Central Asia. The westernmost land, beyond the Chagatai lands and the sea of ​​Aral, was given to the eldest son, Jochi. Because Jochi died shortly before Chinggis Khan, his sons inherited their father’s share. The eldest of Jochi’s sons, Orda, received the eastern lands of his father – Western Siberia, Kazakhstan and the area around the southern reaches of the Syr Darya River. A place not yet conquered in the west was given to the second son, Batu. Batu’s ulus was the territory of the Rus, which of course had to be subjugated to Mongol Khan. In most sources, this territory was coined “Jochi or Batu’s ulus” and “Khanate of the Kipchaks”. The term Golden Horde appeared in the modern era – the first written reference to it was found only in the 17th century. It is also a summary term, since it does not describe a particular nation, but an empire of nomadic tribes and nations with common Mongolian and Turkish origins, which were put under common leadership. Upon the end of the conquest of northern China, in 1234, the Grand Khan Ogedei summoned a quriltai in 1235 with regard to the expansion of the Mongol Empire to the west, that is, the lands that had fallen into Jochi’s jurisdiction but had not been conquered. The campaigns that followed under Batu and General Subotei had dramatic results. Within a decade, he controlled his brother’s “White Horde”, while also incorporating the relatives of the Turkish natives of the Caucasus and the Northern Black Sea, as well as the Bulgars of the Volga. Then he turned west against the Rus princes of the river Volga. The Mongol invasion of the Russian lands was massive, destructive, and had a long-lasting impact. The Princes of Kiev, Galicia-Volynia, Chernigov and Vladimir-Suzdal had, of course, faced the recurring aggression of the steppe nations for decades. Neither the experience of defending against the Patzinaks, or the Cumans, had prepared these Russian Princes for the inevitable, as it turned out, conflict with the Mongols. Unlike the Patzinaks and the Cumans, the Mongols directed their devastating raids in the northern and western territories of Russia. Around the end of 1236, the hordes of Mongolian horse-archers, led by Batu and Subotei, crossed the Volga River, invading Bulgaria of the Volga, and took less than a month to curb the resistance of the weak Bulgarians. In December 1237, Batu unleashed his hordes against Ryazan, whose prince hurriedly sought the help of Yuriy II of Vladimir. After six days of bloody fighting, the city was torched and raised to the ground. The inhabitants were slaughtered before the Suzdal reinforcements arrived. The Mongol Horde then besieged Vladimir on February 4, 1238. Three days later the capital of Vladimir-Suzdal was also completely destroyed. The new army that Yuri was able to put together was annihilated by the Mongols in the Battle of the Sit River on March 4, 1238. Batu then divided his army into smaller – more flexible – units, which moved aggressively in several directions: a section headed toward the Sit River, another two proceeded north and northwest toward Tver, occupying the Torzhok, the gateway to Novgorod. The Mongols, however, did not press on with an attack on Novgorod, because their army was still divided, and the coming of spring would have turned the icy lands into a hell of mud. At the end of 1238, the Mongols focused their attention on the southern regions of Russia. They first subjugated the Polovtsi and the Kirkasians, as well as the Ossetians of North Caucasus. Beyond the Ukrainian steppe, the Mongols destroyed the Russian forces of Pereiaslavl, in early March 1239, and then the forces of Chernigov on October 18, 1239. The last campaign of the year was against the Cumans of the Crimean peninsula. In the autumn of 1240, the Mongols headed for Kiev. The Mongol invasion had aggravated the political crisis that has plagued Kiev. Prince Michael Vsevolodich had sought refuge in Hungary prior to the conquest of Chernikov by the Mongols in March 1239. When the hordes of Batu arrived in Kiev in November 1240, neither of the Russian Prices was able to lead the defence of the city of Kiev. The Mongol army besieged the city, which was conquered on December 6, 1240. Batu ruled the lands of the Golden Horde from 1241, until his death in 1255. After the death of his son, Sartaq, and then the son of Sartaq, Batu was succeeded by his brother Berke (1258-1267). Berke grew up in Khwarazm, making him the first Muslim leader of the Horde. After the death of Grand Khan Möngke in 1259, a civil war broke out for the succession between his brothers, Kublai Khan and Ariq Böke: the new Khan of the newly-founded Ilkhanate of Persia-Syria, Hülegü, supported Kublai, while Berke – for strategic reasons – allied with Ariq Böke. According to some Muslim sources, Hülegü refused to share with Berke the spoils of his campaigns in Persia. Berke was a devout Muslim and had a close relationship with the Abbasid Caliph in Baghdad, Al-Musta’sim, who was executed by Hülegü after the Mongol conquest of Baghdad in 1258. Berke also believed that the Ilkhanate would be a hindrance to the expansionist plans of the Horde in the Caucasus and the Sogdian region south of the Sea of Aral. Soon the two Mongol leaders were drawn into war in 1262, with General Nogai of the Golden Horde being repelled by the Ilkhanate forces at the beginning of the year, while an invasion of the Ilkhanate’s forces into the lands of the Horde through the Caucasus led to a devastating defeat of the army of Hülegü, in 1262, at the Battle of the Terek River in northern Georgia. In the same year, Berke managed to conclude a defensive alliance with the Mamluk Sultan Baybars of Egypt, for obvious geopolitical and economic reasons. Egypt, moreover, was a market for Central Asian slaves (ghulām / ghilmān) and the profitable trade with Egypt and the Eastern Mediterranean can therefore explain why the Golden Horde was so willing to keep the Dardanelles and the Aegean Sea open for business, either through an alliance with Byzantium or through a menacing military presence in the southern Balkans. The geopolitical instability in Bulgaria and Persia coupled with the aftermath of the Battle of Pelagonia (1259) and the recovery of Constantinople by the forces of the Empire of Nicaea (1261), as well as the civil conflict between Berke and Hülegü, contributed to a political climate that precipitated the involvement of the Mongols in the southern Balkans. But let us consider each geopolitical theatre separately. In 1256, Bulgaria was led into a civil war between Mitso Asen (1256-1257), a relative of Ivan Assen II, and the boyar of Skopje Constantine Tikh (1257-1277). Mitso Assen established himself in the coastal town of Mesembria in south-eastern Bulgaria, while Tikh married the daughter of Theodore II Laskaris, Irene, one year after his proclamation as Tsar by the aristocracy in Tarnovo. At that time a third contender of the royal title of Bulgaria appeared. He was a Hungarian nobleman of Russian descent, Rostislav Mikhailovich who served as the duke of Macsó in central Serbia (1248-1262). Mikhailovich had captured Vidin, a riverside port city on the Danube. Having married the daughter of King Bela IV of Hungary, from the outset Mikhailovich was the Hungarian preference to become Tsar. In 1260, having made peace with the Empire of Nicaea, Tikh attacked his most important adversary in Bulgaria: Mikhailovich in the northwest. Although he initially managed to repel him north of the Danube, next year Mikhailovich succeeded in regaining control over his territory with the support of Hungarian troops. At this stage of the Bulgarian Civil War, Tikh’s army suffered considerable losses. And on top of that, Tikh’s diplomatic relations with the Empire of Nicaea worsened when Michael VIII Palaeologus blinded Ioannes IV Laskaris, the brother of Tikh’s wife, shortly after the recovery of Constantinople by the Byzantines in 1261. At the beginning of 1262, Tikh occupied strategic territories of Byzantine Thrace, which were recovered in the following year by the Imperial Army – among them cities such as Mesembria and Anchialos. In order to stop the advance of the Byzantines towards the Hungarian protectorate of Vidin, the intervention of the Hungarian armies was deemed necessary. Due to the increasing pressure by the Byzantines and the Hungarians, Tikh was forced to ask for the help of the Mongols of the Golden Horde, who were the suzerains of the Bulgarians since 1241-42. The Mongols, of course, had another reason to engage in geopolitical developments in the southern Balkans in 1263: the good relations of Michael Palaeologus with the Ilkhanate of Persia-Syria. One year after the bloody battle of the Tarek River in northern Georgia, and while the conflict between Kublai-Ariq Böke and Berke-Hülegü was still in full swing, the involvement of the Golden Horde in the Balkans seemed inevitable. After the restoration of the Byzantine Empire in Constantinople, in 1261, we notice that the balance of power in the southern Balkans shifted. Contacts between the newly established state of the Golden Horde and the Egyptian Mamluks were only possible through the Black Sea, the Aegean and the Mediterranean, so only with the consent of Byzantium. After Berke’s conversion to Islam in the 1250s, the contacts of the Golden Horde with Egypt multiplied, while in 1263 the Mamluk Sultan Baybars sent his envoys to Berke, who were arrested and detained by the Byzantines, probably because the Emperor did not wish to disrupt his good relations with Hülegü of the Ilkhanate, whom he used as a political-military counterweight against the Seljuks in Anatolia. Michael VIII Palaeologus. Miniature from the manuscript of Pachymeres’ Historia, 14th century. The diplomatic relations of the Byzantines with the Mongols and the Egyptians were further exacerbated by the capture of the former Seljuk Sultan ‘Izz ad-Dīn Kaykāwus ibn Kaykhusraw, or Kayka’us II, by the Byzantines, whose liberation was demanded by the Egyptians. Kaykaus was the eldest of the three sons of the Seljuk Sultan of Iconium, Kaykhusraw II, who had led the Turkish forces that were defeated by the Mongols in the battle of Köse Dağ, in 1243. For most of his tenure as the Seljuk Sultan of Rûm, Kaykaus shared the throne with one or both of his brothers, Kilij Arslan IV and Kayqubad II. His mother was the daughter of a Greek priest and he had significant connections with the Court of the Empire of Nicaea. After his defeat in 1256 by the Mongol general Baiju, who had taken over from Hülegü the expnsion of Ilkhanate into Anatolia, Kaykaus fled for a while to the Court of Theodore II Laskaris in Nicaea. A few years later, but certainly before 1261, Kaykaus unsuccessfully sought diplomatic relations with the Mamluks of Egypt, considering that the famous Mamluk victory over the Mongols at Ayn Jalut, in September 1260, was the spark of hope for the opponents of the Mongols in the region. It was then that Kaykaus again had to seek refuge with the Byzantines to escape the Mongol wrath. Although Kaykaus was cordially welcomed by Palaeologus, their relations soon disintegrated. The Persian historian Ibn Bibi, claims that Kaykaus planned to seize power by killing Michael VIII Palaeologus. Nevertheless, the presence of the Seljuk Prince in Constantinople was an obstacle to Paleologos’ regular relations with the Ilkhanate, at a time when the Emperor had given priority to the operational theatre of the Balkans: the imprisonment of Kaykaus was the only option for Palaeologus. 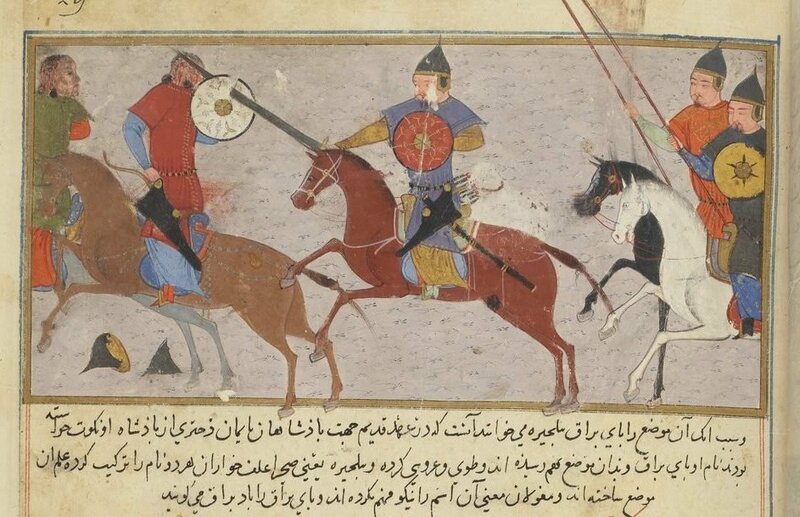 The Seljuk Prince, according to Pachymeres, contacted the Court of the Golden Horde through his relatives in the Crimea and encouraged the Khan to move against the Empire with his Mongols and the Bulgars of Tsar Constantine Tikh, to have him released. We should also note that a sister of his father, Kaykhusraw II, was Berke’s husband. Indeed, another chronicler reports that Kaykaus himself contacted Tish and promised him rich gifts. These were, therefore, the geopolitical developments in Bulgaria and Anatolia, which formed the basis for the military intervention of the Mongols of the Golden Horde against Byzantium in 1264. The Mongols warriors made their appearance in the Balkans in the winter of 1264/65, crossing the frozen Danube into Bulgarian territory. According to Nicephoros Gregoras, there were about 2,000 Mongol warriors from the region of Paristrion, in the Lower Danube. The attackers, according to George Pachymeris, were “autonomous” and were not subject to the power of the Golden Horde. They had ‘come like dogs’, as Pachymeris writes, to destroy the fertile and prosperous areas of the Empire. So this particular campaign may indicate the Bulgarian subordination to the Mongols, since the Bulgarians had to participate in the campaign with a significant number of troops. Contrary to this view, which is shared by many modern historians, behind the invasion was not the official state of the Golden Horde, headed by Prince Nogay; the latter, most likely, did not take part. According to the historian István Vásáry, it was probably a purely Bulgarian initiative against Byzantium, in which Mongol adventurers of the wider region north of the Danube also took part. The release of Kaykaus was apparently not among the priorities of the aristocratic families of the Golden Horde. Michael Palaeologus, who was alerted about the Mongol-Bulgarian invasion as he returned from Thessaly, imprisoned Kaykaus at the Ainos fortress (near the Delta of the Maritsa River) and returned to the city. Eventually, the Ainos fortress and Kaykaus surrendered to the Mongols, following a brief siege, while Kaykaus’ family was deported to Byzantium and his soldiers were recruited into the Byzantine army after they were baptized as Christians. The Mongols, on the other hand, returned to their territories north of the Danube, after looting and causing major disasters in the Thracian countryside. A few years later, in 1271, a new invasion by the Mongols of the Golden Horde troubled Byzantium. This time the invaders were invited by sebastoktorator John, Lord of Thessaly, and Andronikos Tarchaniotis. These events prompted the emperor Michael Palaeologus to regulate his diplomatic relations with the Mongols. He first married one of his daughters, Maria, with the Ilkhan of Persia, Abaqa. In 1272, he married one of his illegitimate daughters, Euphrosyne, to Prince Nogay. After the death of Khan Berke, in 1266, Nogay managed to achieve de facto control the territories west of the Dnieper River, including the Ukrainians of Galicia-Bolynia, the Ossetians and part of the Crimean and Caucasian Vlachs. However, it should be noted that Nogay, while he was by far the most powerful man in the Golden Horde, he did not try to seize the leadership of the Mongol state. Furthermore, Michael Palaeologus married his son and successor Andronikos to the daughter of Stephen V of Hungary. The political and diplomatic importance of these marriages was apparent to its contemporaries: thanks to the diplomatic manipulations of the emperor, Byzantium would have been able to rely on allies who could function as a political and military counterweight against the Bulgarians in the north and the Seljuks in the East. In the second half of the 1260s, the socio-political situation within Bulgaria deteriorated considerably: in 1265, Tikh sustained a serious injury while hunting, leaving him paralyzed from the waist down. This disability significantly weakened his ability to exercise government control. At this time, the influence of Tikh’s second wife, Irene Doukina Laskarina, who died in 1268, and later of his third wife, Maria Palaiologina Kantakousene, a niece of the emperor Michael Palaeologus, was upgraded. The alliance between Palaeologus and Tikh did not follow, however, as the Byzantines refused in 1271 to return to the Bulgarians the cities of Mesembria and Anchialos – which they had occupied in 1263 – and which they had promised as a dowry for the marriage of Maria Palaiologina to Tikh. Both militarily and diplomatically, the Byzantines felt strong enough to denounce the marriage agreement of 1268. And on top of that, Michael Palaeologus urged his ally Nogay to invade and plunder areas south of the Danube. During that critical period, in a region near Provadia (Dobrudja) in north-eastern Bulgaria, a native named Ivaylo began to incite the population in revolt. In Byzantine sources of the time, Ivaylo is referred to as Bardokva, which in Bulgarian means lettuce, or with the Hellenic name Lachanas. Within a few months, the rebels expelled the Mongols from their territories, and at the end of 1277, the also defeated the Royal Bulgarian army. In the battle that took place near Tarnovo, Tikh was also killed. In the short time following the triumphant victory over Tikh, Ivaylo conquered many fortified towns in Bulgaria, who rushed to recognize him as tsar. In the spring of 1278, only the capital Tarnovo remained under the control of Empress Maria. Michael Palaeologus initially sought to marry his daughter with Ivaylo. Eventually, he decided to impose one of his own ‘men’, Ivan, on the Bulgarian throne. He was the son of the former ruler of south-eastern Bulgaria, Mitso Assen, who had sought asylum in Byzantium after the defeat by Tikh, and to whom Palaeologus had granted lands in Asia Minor. Ivan married the daughter of Michael, Irene, and swore obedience to the Emperor of Byzantium before being named emperor of Bulgaria as Ivan Assen III. While Ivan was heading towards Tarnovo, accompanied by a strong Byzantine military contingent, Maria Palaiologina was negotiating with Ivaylo for a marriage between them under the condition that her son, Michael Assen, would be recognized as Ivaylo’s successor to the throne. Her hatred for her uncle Michael Palaeologus, whom she considered a heretic, and the imminent threat to turn Bulgaria into a vassal-state of Byzantium, forced Maria Palaiologina to make that decision. In the autumn of 1278, the Byzantines reacted by sending troops to support Ivan Asen III. They also prompted the Mongols of Nogay to attack from the north. Initially, Ivaylo defeated the Mongols in the north, before inflicting another devastating defeat upon the Byzantine at the narrow passes of the Haimos Mountains in the south-east of the country. Early next year (1279), a Mongol raid led by Nogay, as well as the landing of Byzantine troops in the strategically important Black-Sea port city of Varna, radically changed the situation. One after another the fortresses in eastern Bulgaria fell into the hands of the Imperial forces. Two expeditionary armies, however, were defeated by Ivaylo in a battle in the summer of 1279. After that, Michael Assen was forced to flee to Constantinople, while the boyars in Tarnovo chose one of them, George Terter, to be the next tsar of Bulgaria. The role of the Mongol forces in the eventual surrender of Tārnovo to the Byzantines, as well as the division of the Bulgarian forces of Ivaylo into two fronts, proved decisive. Ultimately, the Bulgarian rebel leader, realising the desperate situation of his forces, decided to seek Nogay’s help against the Byzantines. The Mongol commander appreciated that his interest lay with the Byzantines, so he had Ivaylo executed. By the time the threat posed to Bulgaria by Ivaylo and Ivan Assen III had disappeared, Terter made an alliance with King Charles I of Anjou of Sicily, Stephen Dragutin of Serbia and sebastokrator John I of Thessaly. This alliance, however, soon disintegrated because of the Sicilian Vespers in 1282. The new alliance between John of Thessaly and Stefanos of Serbia that same year triggered the immediate reaction of Michael VIII in Constantinople. The latter, in concert with Nogay, were preparing an invasion of Thessaly from the north, but the death of the emperor on 11 December 1282 put a premature end to this ambitious campaign. In the middle of the decade, the despots of Vidin and Branicevo in the northwest of the country – previously independent for about three decades, came under the influence of Nogay, and in 1285, Terter was forced to send his son and successor Svyatoslav as a hostage to the Mongol prince. Following a Mongol raid south of the Danube in 1291, the Tsar of Bulgaria George Terter was forced to declare his submission to Nogay, before escaping to Constantinople. His position was taken by the “man of Nogay in Bulgaria”, an aristocrat named Smilec, who had married a sister of the sebastokrator Konstantinos, the brother of Michael VIII Palaeologus. Nogay had now become the most powerful ruler of the Balkans, but also a dangerous opponent for the Khan of the Golden Horde, Toqta. The latter reacted fiercely to Nogay’s secessionist movement in Romania. The conflict between them ended with the death of Nogay on the battlefield of Kugenlik, near the Dnieper River in southern Russia, at the end of 1299. The Byzantine emperor wanted to maintain his friendship with the Golden Horde. That is why, after Nogay’s death, Andronikos II offered Toqta as his wife his illegitimate daughter Mary, an offer that the Mongol leader accepted. However, the death of Nogay caused a significant weakening of the Mongol influence in the Balkans, and especially in the Danubian provinces, since the epicentre of the Mongol power had now been shifted to the capital of the Golden Horde, Saray, on the Lower Volga River. Nevertheless, the Mongol presence in the Balkans did not disappear until after the turn of the century. On the contrary, during the reign of Theodore Svyatoslav (1300-22), the relations between the Bulgarians and the Mongols were, we could say, balanced. The Bulgarians recognized the Mongols’ suzerainty and the payment of a tax, while in return they secured complete control over the rich areas of the Danube Delta and the Dniester, and possibly Bessarabia. This situation changed after the death of Svyatoslav in 1322, when semi-independent groups of Mongols settled in Dobrudja, on the Danube Delta, took part as mercenaries in the clashes of the various rulers in the southern Balkans. In 1322, the Bulgarian boyars elected Michael Sisman, boyar of Vidin, as the next Tsar, an aristocrat who had maintained close contacts with the Mongols in the Balkans. Michael Sisman used an army of mercenaries, which included a large Mongol contingent, to recover the cities of south-eastern Bulgaria that had switched allegiance to the Byzantines after the death of Svyatoslav, although he avoided any pitched battle against the Byzantines, who at that time were besieging Philippopolis. In the autumn of 1323, contemporary historians like Kantakouzenos report a large-scale Mongol invasion of Byzantine territory. It was carried out by 120,000 warriors with two leaders, Taytaq and Toğlu-Torgan. The Mongol troops plundered Thracian areas for more than 40 days, but the Emperor Andronikos II failed to deal effectively with that threat. He first retreated to Adrianople, and then to Didymoticho. Andronikos III came the throne in 1328, after overthrowing his grandfather. Within weeks Michael Sisman invaded Byzantium, probably in July of that year, plundering many cities in northern Thrace. Andronikos III led his army to the area, but Sisman did not wish to confront the Byzantines in a pitched battle and withdrew to Bulgaria. In September 1328, Tsar Michael invaded Thrace for the second time and captured the city of Bukelon, near Adrianople. This time there is no explicit reference of Mongols in the Bulgarian army, but their presence is considered quite possible. In the spring of 1331, the Bulgar boyars selected a new Tsar, as Sisman had died in the early spring of that year. According to the sources, the young Tsar Ivan Aleksandr used a large number of Mongols in an attempt to regain the southern Bulgarian cities, such as Mesembria, which had seceded to Byzantium. This action led to direct conflict with the Byzantine Emperor Andronikos III, who moved against the strategically important city of Anchialos on the Black Sea. According to Kantakouzenos and Nicephoros Gregoras, on July 18, 1332, 8,000 Bulgarians and 2,000 Mongol soldiers, on the one hand, and units of the imperial army, with a total force of 3,000 men, were struggling from the other. The Byzantines were defeated and withdrew to Rosokastro, and an agreement between the Tsar of Bulgarians Ivan-Aleksandr and Andronikos III Palaeologus was struck immediately afterwards. Andronikos III (1328-41) tried to maintain friendly relations with the Mongols of the Golden Horde. The relatively balanced diplomatic relations between Byzantium and the Golden Horde were only disrupted in 1337 when another Mongol invasion shook the Empire. Only Nicephoros Gregoras has mentioned this invasion, according to whom the main cause of the invasion was that Byzantium had forgotten to dispatch their tribute and gifts to the Mongol court. Thus, in the early spring of 1337, groups of Mongol soldiers crossed the Danube and looted regions of Thrace down to the Marmara Sea for more than 40 days. At some point the Mongols fell upon Turks who had crossed the Marmara Sea to plunder Thrace, and the Turks were captured. This was the last Mongol invasion of the Balkans attested in the sources. The era of Mongol influence in the Balkans lasted more than a hundred years, from the great invasions of 1242 to the reign of Khan Yanibek (1342-57). Then, due to the growing political anarchy within the Golden Horde, which led to complete political confusion after the death of Berdibek Khan (1359), and the coming of the Black Death in the 1340s – which contributed to the socio-economic turmoil of the period – the state of the Golden Horde lost all its influence and interest in the Balkans. This century of Mongol influence in the Balkans can be divided into three periods: the first is characterized by the ever-increasing power of Prince Nogay, the lord of the western parts of the Golden Horde, from the Don River to the mouth of the Danube. The geopolitical instability in Bulgaria and Persia, combined with the Byzantine recovery of Constantinople, as well as the civil conflict between Berke and Hülegü, contributed to the creation of a political climate that favoured the involvement of the Mongols in the southern Balkans. The end of this phase was heralded by the deaths of the three rulers of the region: the Bulgarian tsar Konstantin Tikh in 1277, the Khan of the Golden Horde Mengu-Temur in 1280, and the Byzantine emperor and founder of the Palaeologus dynasty, Michael VIII, in 1282. The change of power in these countries led to the second phase, a period of weakening and disintegration in Bulgaria and Byzantium, while the power of the Tatar Prince Nogay reached unprecedented levels, so that his son even became Bulgarian Tsar at Tarnovo for two years (1299-1300). The peak of Mongol influence in the Balkans ended with the deaths of Nogay (1300) and his son Ceke (1301). The last phase of the decline of the Mongols’ presence in the Balkans coincided with the first half of the 14th century, introducing a new period in the history of the Balkans and Asia Minor when the Ottomans would become the main adversary of the Byzantines. Georgios Theotokis: Ph.D History (2010, University of Glasgow), is historian specialising in the military history of eastern Mediterranean in Late Antiquity and the Middle Ages. He has published numerous articles and monographs on the history of conflict and warfare in Europe and the Mediterranean in the Medieval and early Modern periods. His first monograph was on theNorman Campaigns in the Balkans 1081-1108 (2014), while his second book on the Byzantine Military Tactics in Syria in the 10th century came out in October 2018. He has taught in Turkish and Greek Universities; he is currently a postdoctoral researcher at the Byzantine Studies Research Centre, Bosphorus University, Istanbul. Click here to read more from Georgios Theotokis.